A ruling by the Osaka District Court is likely to deal a major blow to the tattoo industry in a country where the stigmatisation of tattoos is already widespread due to their historical associations with gangsters and a general social pressure for conformity. 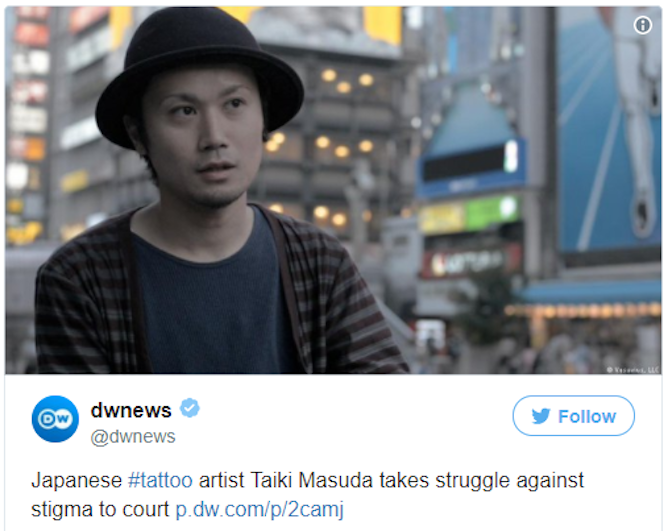 The issue goes back to April 2015 when five plain-clothed detectives from the Osaka Prefectural Police raided tattoo artist Taiki Masuda’s studio. They confiscated his tattoo equipment and arrested him for having tattooed three customers. Masuda was found guilty in September 2015 in the Osaka Summary Court (broadly equivalent in status to a small claims court in the UK or US) of violating the Medical Practitioners’ Act for tattooing the customers without a medical practitioner’s license. He was ordered to pay a fine of 300,000 Japanese yen (about £1,600 at the time). Masuda was not the first nor the last tattoo artist in Osaka to be fined in 2015 for tattooing customers in violation of this act. But he was the only one who refused to pay the fine. He opted instead for a full trial in the Osaka District Court (the next highest court after a summary court) because, he said, “accepting this fine will make all of the tattoo artists in Japan criminals”. Article 17 of the Medical Practitioners’ Act (1948) states that: “No person except a medical practitioner shall engage in medical practice.” But it does not specifically state what constitutes a “medical practice”. In 2001, however, in an attempt to regulate the burgeoning permanent cosmetic makeup industry, the Ministry of Health, Labour and Welfare issued a notice in which it stated that “針先に色素を付けながら、皮膚の表面に墨等の色素を入れる行為” [lit. putting pigment on a needle tip and inserting ink into the skin] constitutes a medical practice that can only be carried out by those with a medical practitioner’s license. Until 2015, this notice was primarily used by health authorities in regulating cosmetic makeup tattoo practitioners. But this changed when the Osaka Prefectural Police started using it to arrest tattoo artists for violating the Medical Practitioners’ Act. Viewed in retrospect, it is not surprising that this change began in Osaka. Tōru Hashimoto, Osaka’s city mayor at the time, was vocal in his opposition to tattoos – in 2012, for example, he asked all Osaka City employees to complete a questionnaire declaring if (and where) they had a tattoo and then suggested that those who did resign as they were not fit to be municipal government employees. Osaka-based Masuda founded the campaign group Save Tattooing in Japan in 2015. Over the past two years, the group has worked to raise national and international awareness of the situation facing tattoo artists in Japan and also petitioned Japanese prime minister Shinzō Abe for a system of licensing and qualifications for tattoo artists in Japan. If the court decides that tattooing requires a medical licence, then none of the tattooists will be able to carry on tattooing … This trial has significant meaning, because it will decide whether the art of tattooing can continue in Japan. Masuda’s trial was held at the Osaka District Court between April and August 2017. Encouragingly for the tattoo industry, it sparked the interest of the legal community within Japan with experts in Japanese criminal law, including respected university professors, testifying for the defence. Nevertheless, on September 27, the presiding judge, Takaaki Nagase, found Masuda guilty of violating the Medical Practitioners’ Act for tattooing the customers without a medical practitioner’s license and set his fine at 150,000 Japanese yen (about £992). It is difficult to predict exactly what will happen next. Masuda has announced that he will appeal the court’s ruling. But if judicial and police authorities across Japan follow Osaka in requiring tattoo artists to have a medical practitioner’s license, then it is likely that increasing numbers of the approximately 5,000 tattoo artists currently in Japan will be charged with the same crime. This would inevitably lead to some giving up tattooing, going underground or going abroad. But after the Osaka District Court’s ruling, Hatsushika’s vision is looking more unlikely than ever.